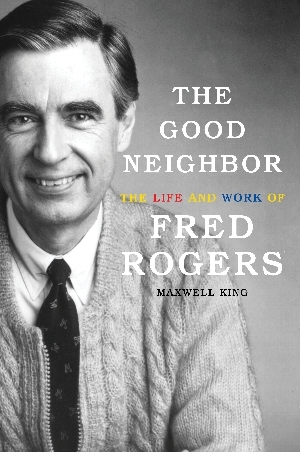 Mon, September 24, 2018 7:30 P.M.
It’s a beautiful day in the neighborhood as we welcome Maxwell King, author of The Good Neighbor, a personal, professional, and artistic biography of Fred Rogers. A figure as deceptively sophisticated as the namesake television program that brought an unerring message of kindness, compassion, and equality to millions of children, Mr. Rogers remains one of America’s most beloved cultural icons. King, CEO of the Pittsburgh Foundation, former president of Heinz Endowments, and editor of the Philadelphia Inquirer for eight years, weaves archival documents and original interviews into a portrait of the man who—spoiler alert—really was as gentle and empathetic as we all hoped he’d be. Speedy delivery! Mostly known for his portrayal of Mister Rogers’ deliveryman, David Newell was also the director of public relations for The Fred Rogers Company. As an ambassador for everyone’s favorite neighborhood he toured the world as Mr. McFeely until his retirement in 2015.